So I run an excessive manifold on my K24, The nice thing about them is I can make little changes to it easily it's not a one size fits all. I talked to them and apparently the owner has an S2000 and a manifold is in the works with them. I did the quick math on my K24 and I need a 55mm runner that's 12 inches long (including the head area). I've got a 58mm runner currently that's 11.5 long. So I'm in the ballpark. Those interested in a manifold might be worth dropping a bug in his ear to see if you can push the process along. It's nice because it's a very tuneable manifold and you can easily make changes based on what you want. Just so I have a better understanding, the area to measure is where the mani bolts to the head all the way to the back (inside) of the plenum/chamber? IIRC the measurement of the face of the head to the back of the valve was 2.5 inches. So you can add that to the length of the pipes from the face of the head to the plenum to get your plenum length. I used the math on team integra which when I did their math backwards and compared to my actual dyno it backed it up to be accurate. But they claims that you get your runner length. 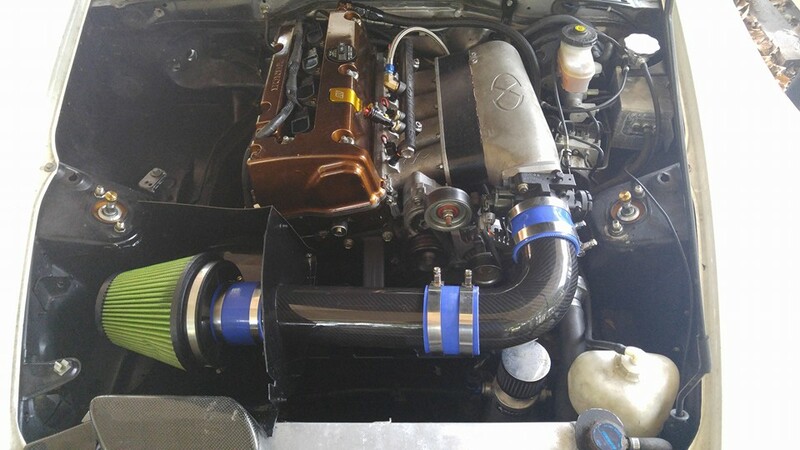 "The general rule is that you should begin with a runner length of 17.8 cm for a 10,000 rpm peak torque location, from the intake opening to the plenum chamber. 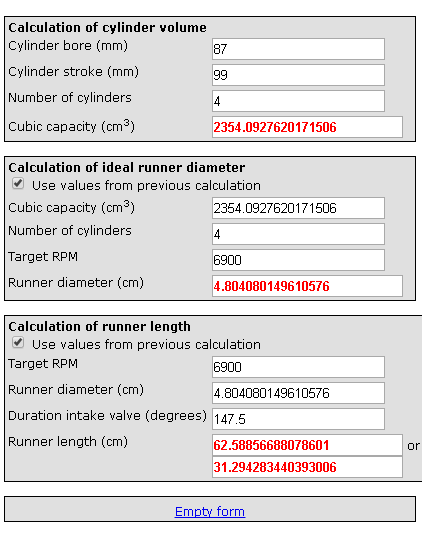 You add 4.3 cm to the runner length for every 1000 rpm that you want the peak torque to occur before the 10,000 rpm. So, for instance, if peak torque should occur at 4,000 rpm the total runner length should be 17.8 cm + (6 x 4.3 cm) = 43.6 cm." i did the math wanting a peak tq about 1000 rpm before redline for a race motor. On something that gets more street miles you might want it lower then that. But without having cuved tubes your not gonna get a runner much longer then 12 inches in that engine bay, your just out of space. Last edited by Mrsideways; 10-28-2016 at 09:56 AM. I feel I want peak torque somewhere around 5-6krpm. So I measured and even though I read your post...don't be surprised if I did it wrong lol. So from the valve to the back of the plenum was 11.5". Runners from valve, you mean the valve in the head? According to Ian you include that measurement so I did. His post mentioned it's 2.5" from back of valve to head opening. Last edited by s2000ellier; 10-29-2016 at 09:00 AM.